Westringia ‘Flat n Fruity’ is a new prostrate form of the Australian coast rosemary, Westringia fruticosa, a ubiquitous plant down Australia’s east coast which you can find even out on windswept rocky coastal headlands. ‘Flat n Fruity’ is a totally prostrate form growing to only about 30cm high and spreading several metres wide. 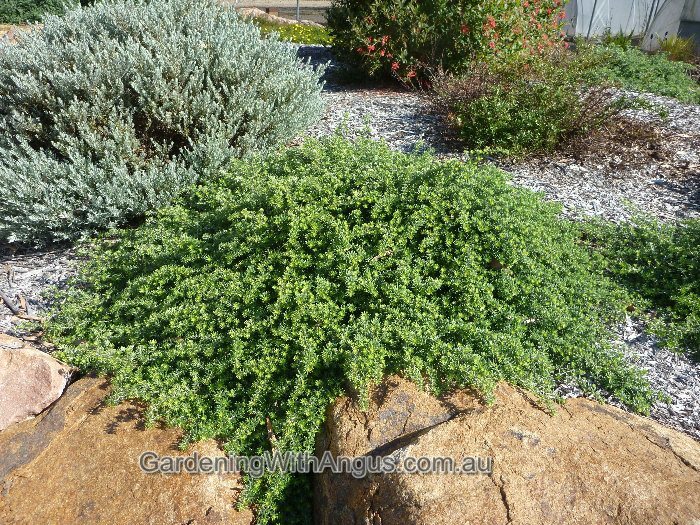 Grow ‘Flat n Fruity’ as a groundcover or spilling over retaining walls, or to prevent erosion on steep embankments. ‘Flat n Fruity’ copes with dry shady spots underneath eucalypts and has lovely grey foliage that contrasts well with the bright reds and oranges of nearby kangaroo paws. 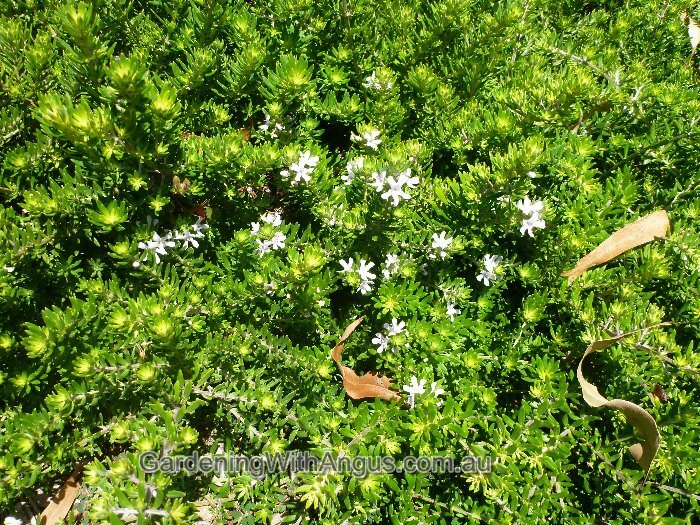 Small white flowers appear through most of the year. It tolerates a wide range of soil conditions from sandy to even quite clayey soils. Use it in windy sites and frontline coastal conditions. It’s very tough and requires very little water or fertiliser. I’ve even seen it grafted as a weeping standard onto Westringia fruticosa understock.